Imagine, if you will, walking into an end-of-the-world Wiemar cabaret, a bright salon on the eve of a revolution. The air rich with decadence and possibility, and the clear whiff of luxury. 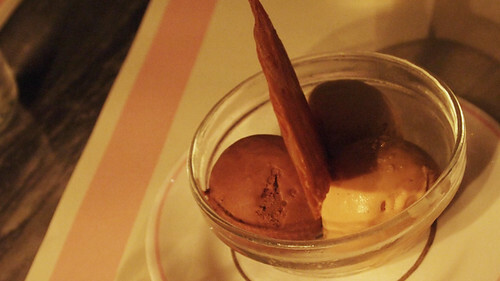 This Soho joint, beloved of bloggers, has been covered favourably and extensively elsewhere. I’ve avoided it till now, mainly because of it’s online ubiquity, there was a nagging worry that it couldn’t possibly live up to all the praise. I was wrong. Books, covers and judges have gone flying out the window. It’s all green leather, dark wood and art deco tiles, like a glam and stylish Al Capone speakeasy in a twenties Moscow back alley. I love this sort of almost-too-luxurious place, even if I can’t afford to go there that often. I like well made things. And whether that’s a Global chef’s knife, a Le Creuset pot or quails eggs with black truffles, I consider it money well spent. And for once, I chose very well. Possibly because I didn’t select the main, a succulent leg of Elwy lamb cooked to pink and juicy perfection. All plaudits for that go to Catty. But my chosen starter was superb. 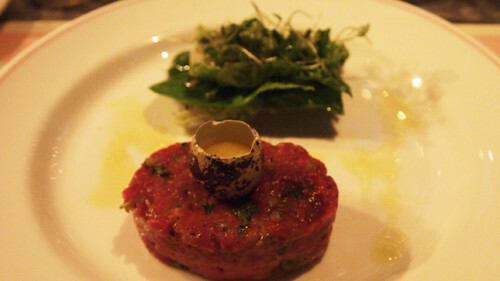 It was beautifully prepared venison tartar. The seasoning was spot on and no Worcestershire or Tabasco were required. Unctuous, smooth, meaty with a strong, but not overwhelming taste of deer. I could have had this for starter, main and dessert. Hell, i could’ve had it for elevensies and been happy. The quails eggs and truffles showed some deft handling of strong flavours. 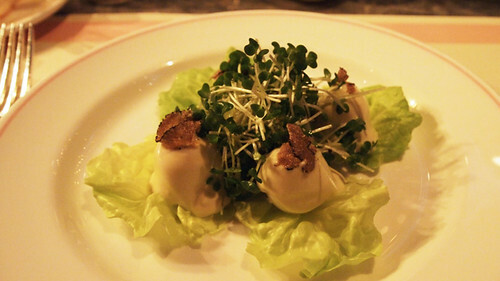 Instead of overwhelming the creamy eggs, the truffle added an intense bouquet of earthy richness. The sort of thing you’d expect Bacchus to chow down with his vino. A prawn cocktail was a pitch perfect rendition of the fifties classic. Big juicy pink prawns hung like punch glasses around a bowl. Looking over a pile of pink sauce and shredded lettuce. Out of which a grumpy looking prawn face glared. 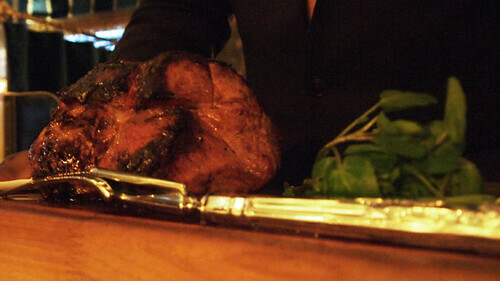 The aforementioned lamb was tasty, a classic example of well sourced meat, cooked simply and brilliantly. This was actually as good as my mum’s lamb, which is not something I’ve ever been able to say of any restaurant roast lamb. 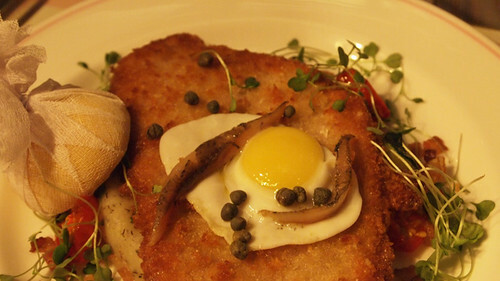 Mr Noodle’s veal Holstein was flawlessly executed, with a wee little quail’s egg fried and laid atop the golden crispy crunchy plate of tender cow. This was good stuff. And it came with smooth, earthy truffled mash. And the pudding – oh my God the pudding. Another masterstroke of menu choosing here, I went for salted caramel ice cream with oh, some other flavours. Spooned, well shovelled really (there were greedy glances coming my way), into my mouth after a shot of frozen vodka, the sweet-savoury tang made my toes curl and squeezed a little jig of pleasure out of my tapping feet. So, BobBobRicard. Big, bold and somehow still well balanced. Not for a daily visits, it’d tarnish the allure. But when the world’s crashing down around my ears, this is the place where I’ll be partying. Going down, all hands on the champagne bottle. I rather like the idea of a World’s End party of BBR, blows my suggestion of galloping down to Taco Bell right out of the water. If the time ever comes, you have my number don’t you? Isn’t it a fabulous, place? Cannot believe we were there on the same night last week AND DIDN’T SEE EACH OTHER. I swear you are a phantom. I had the onglet – wonderful. @Greed Diva – I do love it there. And I know – (be-champagned) ships passing in the rather glamourous night… The onglet would have been up there as a close second I think, and the Zakuski look fab. Excellent writeup. Certainly does Bob Bob Ricard justice. You forgot to mention the ‘secret sauce’ that was hiding in the middle of the truffle mash underneath my veal! By the way, that’s ‘secret sauce’, which isn’t to be confused with ‘special sauce’, which is something entirely different! Great evening and thx again for organising. Man this place has changed since I visited. It was easily one of my worst meals of 2009. By a long way. I left and nearly went to the Wolsely to rinse myself off. However, now, and with a bit of maturing, it seems to merit a revisit. @Tom – yeah, it got slated at the start of 2009 by a few people, then, in 2010, it started getting all those rave reviews. So someone obviously pulled their finger out. I had a really really good meal. Almost up there with ESI. Almost. And you already know what i think about them. Also, the experience and atmosphere really add something extra to the food itself. Have been so often, since my first visit just as the year was newly born, that I’ve actually lost count. Have always had the greatest time. Am holding my bday party there soon. Can’t wait. So glad you had much excellence. @Kavey – it is the whole experience there isn’t it? The feeling of sipping champagne in the midst of comfortable luxury. Lovely. How could you not ‘press for champagne’? Although I found that pushed once it became strangely addictive. I did get a glass of fizz from Bob and so was able to resist…this time. I am SO glad you shared that lamb with me. Otherwise there was a real chance I would have ordered a leg of lamb for two JUST FOR ME! ps. I still want your salted caramel ice cream!! Now i shoulda thought of that, we could have had the lamb and something else… i had a bottomless stomach that night, it was all part of the magic. Heh, we’ll just have to go back for the ice cream.